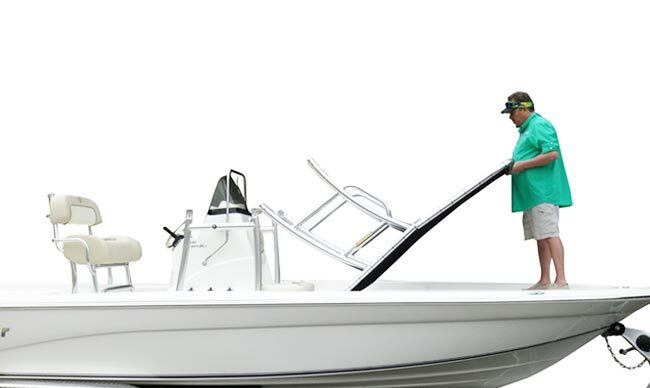 Universal fit on any center console or rib/inflatable boat with a console 24" to 50" wide. It Folds Twice™ - Once at the side supports and a second time in the canvas. Beefed up 2.25" tubing will not rattle and shake in fresh or salt water. OEM styling that matches the lines and look of modern boats. Two tier canopy is 35 square foot with a truss design that keeps the Sunbrella® fabric taut to repel water and block sun. 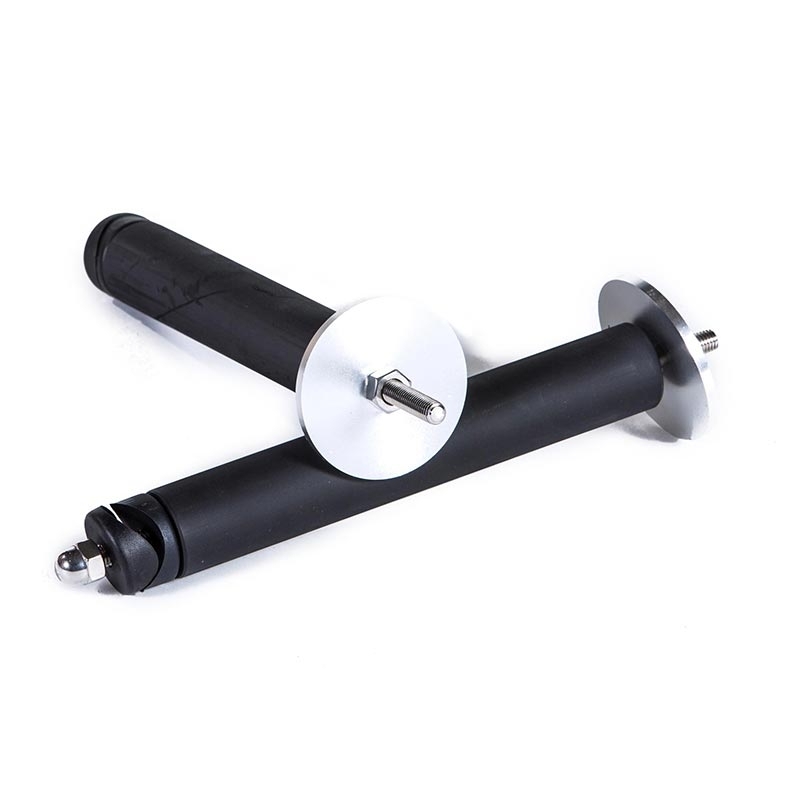 Ergonomic grab handles are 1.9" in diameter for a comfortable and secure hold. Works seamlessly with side console door. No modification needed! 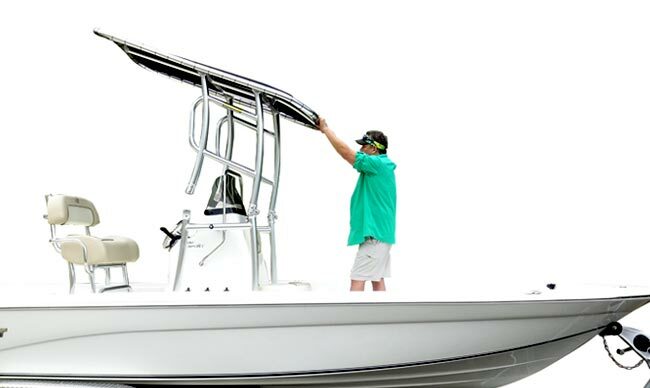 You bought the highest quality center console fishing boat available, and now you need the very best folding T-top to go with it? We’ve got you covered—literally—at Fishmaster. You can see the new curvaceous styling at a glance, matching the sleek lines of today’s boats. Available in both anodized and bone-white powder-coat, you can choose whichever finish best matches your fishing machine. Like the Original Fishmaster T-Top, the Pro Series utilizes our Patent #7418918, so it will easily fold down for garage or dry stack storage with the unique second canvas fold - purchase our Pro Series Quick Release Knobs to fold this t-top in minutes without tools. 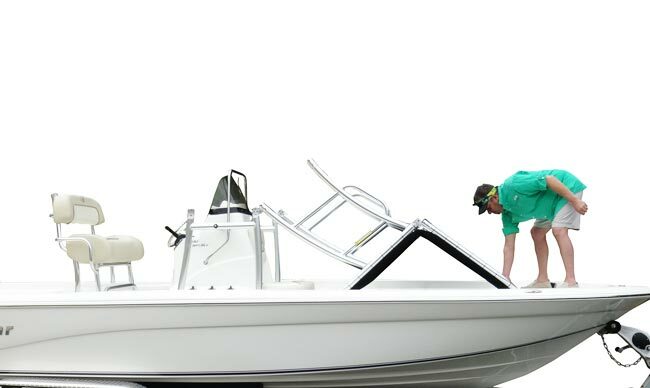 Standing a hair over 84 inches over the deck when fully upright, folding the top down saves you several feet of overhead clearance (the exact folded height depends on what your boat may or may not have in front of the console). Next level T-Top that braves the heart pumping and rougher blue water. heat treated aircraft aluminum for increased strength to weight ratio. Match the Pro Series T-Top to your boat's accents by choosing between polished and bright-dipped anodized or bone white powder coat. Both finishes are masterful at protecting against harsh marine environments; however, the manufacturing process differs. Polished then anodized gives the ttop a .5 to 2.5 micron finish that protects against salt, sun, and rain by preventing corrosion. This finish results in a durable and easy-to-clean ttop. Powder Coat heats polyester powder to fuse into a protective layer and provide a finish with an average thickness of 5mm. 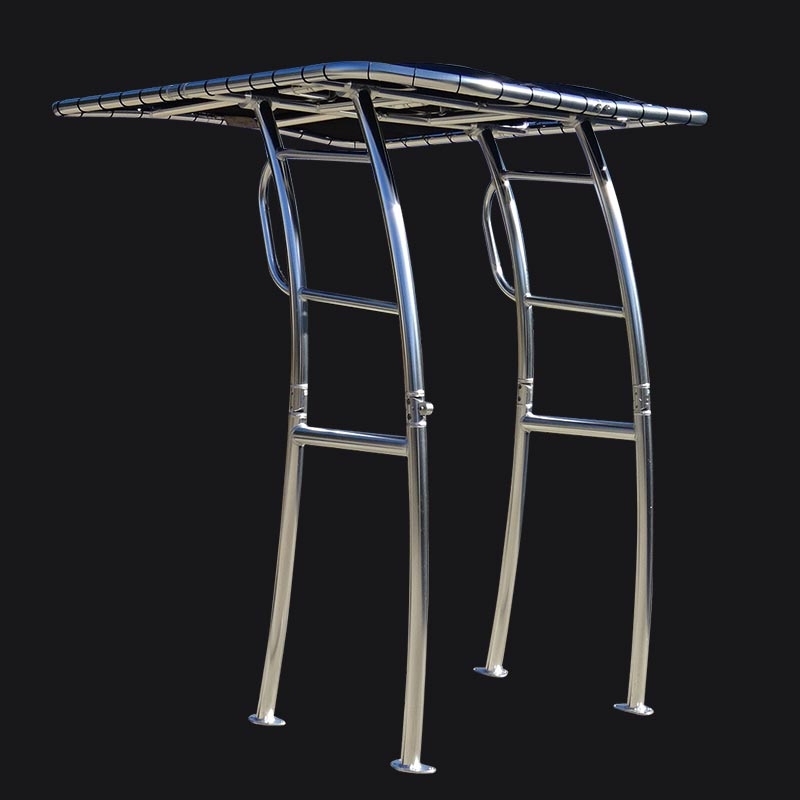 Powder coat is high-quality and durable finish that never needs to be waxed. Car manufacturers commonly use powder coat for wheels. Over 35 square feet of coverage to protect from the sun or an unexpected downpour. 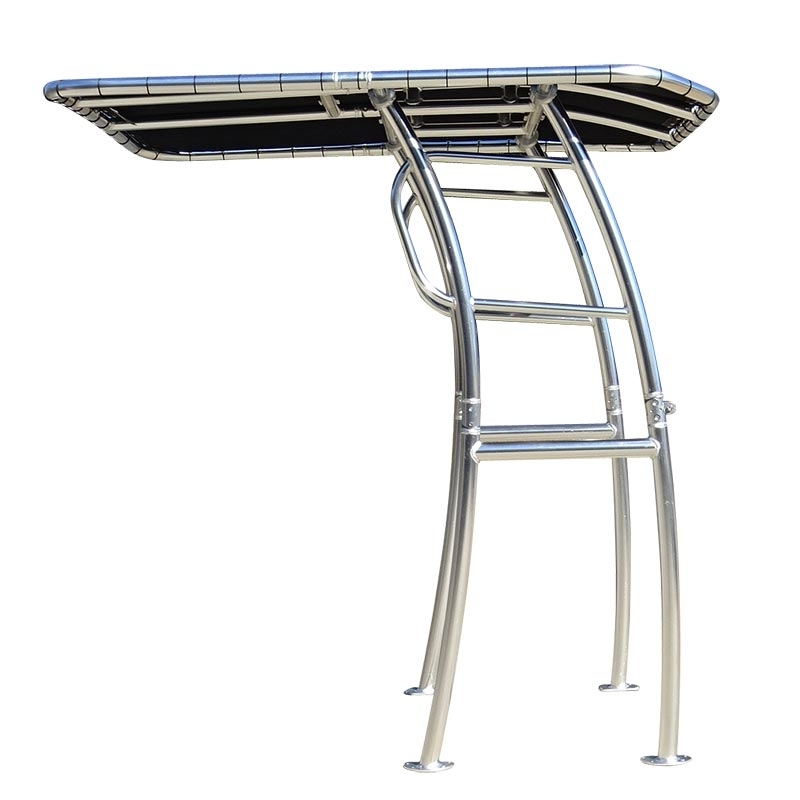 Canopy works much like the side support frames often found in more higher end custom tower designs. Our two tier structure keeps the Sunbrella® canvas top tight to repel water and offer proper drain of moisture while sitting at a dock or underway. Choose from nine Sunbrella® canvas colors to match your boat’s look. Universal for consoles from 24” to 50’’ wide. Strong, Stiff, and Silent. Guaranteed! The Pro Series T-Top is backed by a 5 year warranty. Billet machined clamps, tubes, and breakaways. The beefiest side structure supports on the market today. 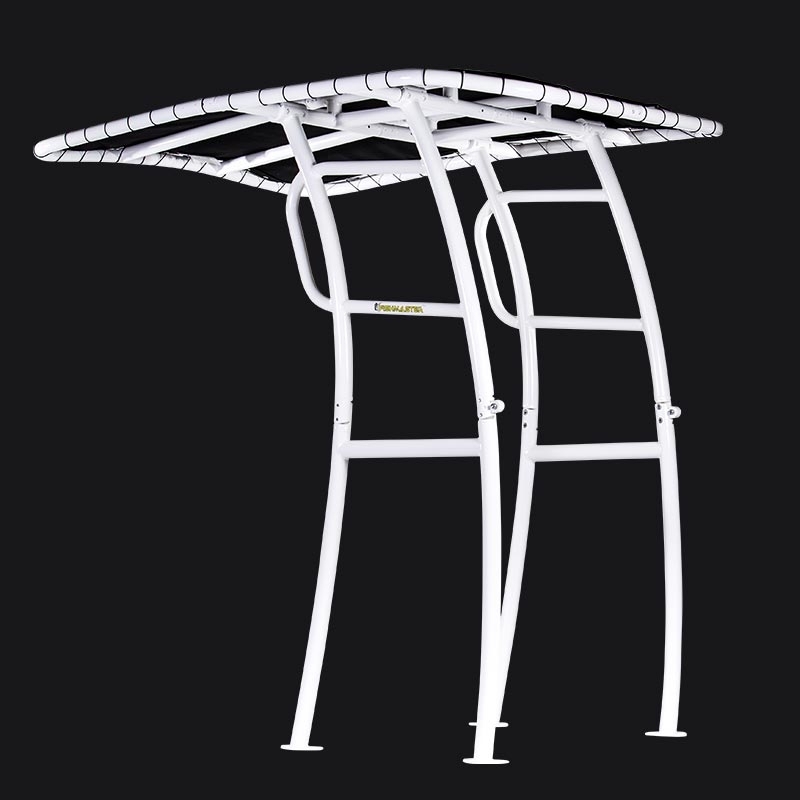 Top truss structure supports all universal fishmaster accessories. Each Pro Series T-Top has a sticker with a serial number printed on it for lot trace ability and production validation on construction. Engineering design concept and construction has been independently tested for harmonic vibration and impact testing. Virtually stimulating years of use. Every Pro Series T-top ships with 3M® part number 5200 adhesive for installation and a storage pack that includes two beverage holders, two pole pockets, and a storage tote bag. I don't usually buy a big ticket items sight unseen. I have to tell you that the fish Master Pro t-top is amazing. It came within 3 days of when I ordered it and all parts were there as well as excellent packaging in the two large boxes. I ordered it with the powder coat which was excellent. Using both the video and the directions included in the Box I was able to mostly build it by myself. My neighbor help me with leveling the first leg and getting the top structure onto the boat. I had one question for customer support and Greg was quick to answer and respond to my question. After a sea trial I was amazed how rigid the top was and it didn't really affect my speed at all. They claimed it to be aerodynamic and I agree. I highly recommend this top and I'm looking forward to many years of use. I'm also enjoying the compliments I'm getting from friends and family. Had the top for a month now and the complements don't stop. The speed is not affected at all and it's rock solid. Love it ! !